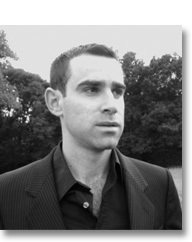 James Byrne was born in Buckinghamshire in 1977 and divides his time between New York City and London. He is Editor of The Wolf, a poetry magazine he co-founded in 2002. His second collection, published in 2009, is entitled Blood/Sugar, from Arc Publications. He has translated the Yemeni national anthem and is currently working on a project to publish contemporary Burmese poets. In 2008, he won the Treci Trg Poetry Festival prize in Serbia. In 2009 his New and Selected Poems: The Vanishing House was published by Treci Trg (in a bilingual edition) in Belgrade. In 2009 his poems were translated into Arabic for the Al-Sendian Cultural Festival in Syria. He is the co-editor of Voice Recognition: 21 Poets for the 21st Century, published by Bloodaxe, and is co-editing Paris and Other Poems by Hope Mirrlees (Fyfield Books 2011).